Torquay's Saturday Pennant players gathered for an end of season BBQ in the clubrooms last night 8/3/16. Over 60 members attended, enjoying the catch up as well as the Lou Crameri Medal count for "Most Consistent Bowler 2015-16". Winning for a second year in a row with the highest votes scored was Alan Sampson, who not only had consistent bowling in Premier Pennant but a few other feathers in his cap this year. He is Torquay's 2015-16 club champion and went on to reach the semi final of the GBR Champion of Champions. He, with Karen Harrington, has won the GBR State Mixed Pairs and will play in the BV Championships week held in Bendigo in April. 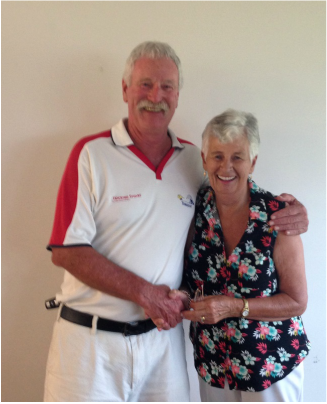 Alan won the GBR Over 60s Singles and played through to reach the semi final in the BV Championships held in Bundoora. He also paired with Daryl Kitchin in the GBR Over 60s Mens Pairs, winning the title and going on to BV Championships in Bairnsdale, where they achieved runners-up in the final.